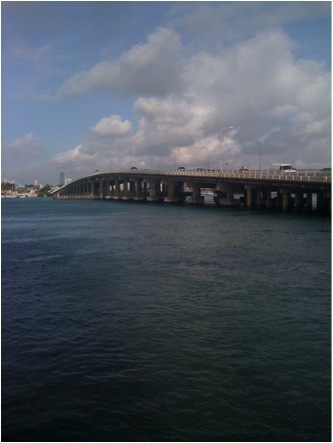 Photograph near the MacArthur Causeway, where Zora Neale Hurston lived on a boat named The Challenger in 1950. Photo circa 2010 by Lara Stein Pardo. Mapping Miami is a project about Miami’s cultural and artistic history. It is part of a larger Mapping Arts Project that ‘maps’ cities through places where artists have lived and worked. In Miami, we are beginning with a focus on the time period of the 1920s through the 1950s. While this was a particularly active time period for local and global events and the arts in Miami, it is also a time period that most people don’t know much about. This period included the Great Depression, World War II, the boom of Overtown in Miami, and also two major hurricanes which devastated parts of South Florida. Throughout all this change, the arts were active in Miami. Did you know, for instance, that dramatist, writer, and anthropologist Zora Neale Hurston lived on a boat near the MacArthur Causeway for periods of time in between trips to Honduras? Or, that Billie Holiday maintained a room at a boarding house called Georgette’s Tea Room in Brownsville? Did you know that playwright Tennessee Williams staged A Streetcar Named Desire at the Coconut Grove Playhouse in 1956? 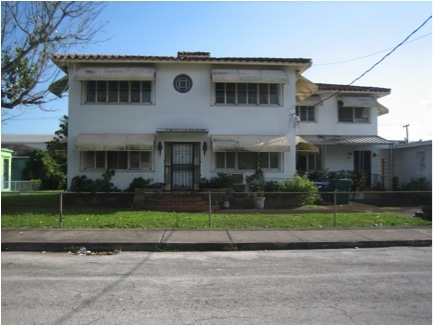 What about the fact that Robert Frost owned a home in South Dade called Pencil Pines? He even wrote a poem by the same name as the tall pines on the property inspired his work. These are just a few examples of the artists and places we are mapping in this project. Our map-in-progress shows these sites and more: http://goo.gl/maps/UPXm. The Mapping Arts Project connects the arts, history, and the public in an innovative way. Inspired by my background as an artist and cultural anthropologist, I started the project in 2009. In 2010, Blackbird Arts and Research, a 501(c)3 nonprofit organization, was founded to support this work and other innovative projects that connect history, arts, and the public. This project has received support by granting organizations, archives, and universities including the Miami-Dade Department of Cultural Affairs, the Deering Estate at Cutler Bay, HistoryMiami, the University of Miami, Arts of Citizenship at the University of Michigan, and Imagining America. They have helped the project to grow while providing much needed historical content, research assistance, and seed funding. We recently received a Community Grant from the Miami-Dade County Department of Cultural Affairs, and now we are seeking to raise funds from individuals to match the grant and develop the project. 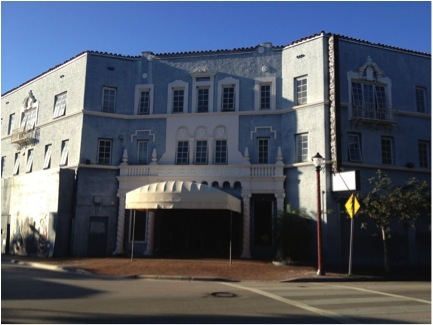 Photograph of the Coconut Grove Playhouse, where Tennessee Williams staged A Streetcar Named Desire in 1956. Photograph circa 2013 by Lara Stein Pardo. Connect arts, history, and the public by sharing valuable information in an open access format (free and online). Build a well-designed website that shares information and images in a way that is easy to access, and looks good too. People engage with history and the arts in new and fun ways. Develop a platform for this kind of project so that more projects like this can be developed in the future. Build on and connect resources already available, but may not be easy to find or access. Showcase the importance of arts and history in Miami and other cities. Link geography and the arts by using maps to tell the story of cultural arts history. Reach broad audiences ranging from children to adults, locals to tourists, students to professionals, and more. Inspire artists, writers, musicians, performers, dancers, and anyone interested in the arts, really, by sharing our rich cultural heritage. 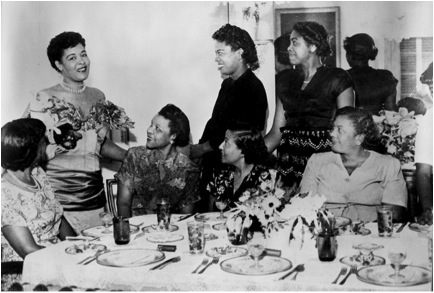 Billie Holiday at Georgette’s Tea Room circa 1950, courtesy of HistoryMiami. Georgette’s Tea Room circa 2011, photograph by Lara Stein Pardo. If you would like to learn more or become a supporter of the project, we invite you to visit our page on Indiegogo: http://igg.me/p/296071/x/1899410. All contributors will become members of the project, and receive behind the scenes updates, invitations, and news. We also came up with some special perks to show you our thanks. We’re looking forward to including you, your story, and our history in the project. This project, like the Culture Builds Florida campaign, highlights the diversity of the Miami community and its residents, creates connections to our history and heritage and reminds us that Florida is a special place to live and work. As part of this interdisciplinary project, we plan to share archival photographs and documents, information about the artists, essays, syllabi, lesson plans, tours, podcasts, and even more as we move forward. By making this information available and then doing the same for other cities, we will illustrate and emphasize the important role of the arts and artists to the development of our communities. This entry was posted in Spotlight On and tagged Billie Holiday, Lara Stein Pardo, Mapping Miami, Miami, Robert Frost, Tennessee Williams, Zora Neale Hurston by culturebuildsflorida. Bookmark the permalink.